Farm Tub is a registered trademark for decorative self-watering planters and growing systems for vegetable and flower gardening. Farm Tub Planters and DIY Self-Watering Kits utilize a water reservoir and capillary wick system that is easy to manage and self-irrigates once plants are established. For effectiveness, the system requires the use of a high-grade potting soil, such as Black Gold Natural and Organic Potting Soil. Farm Tub growing systems are available as part of a custom-made Farm Tub Planter or as a Do It Yourself Kit to convert existing planters or stock tanks to become self-watering. Water conscious gardeners as well as travelers love the Farm Tub growing system because they don’t have to worry about watering as often or while away. Grow your own food, herbs, and flowers while maximizing yield and conserving water. Growing your own food need not be messy or look utilitarian. Farm Tub Planters were created so that you can customize your own planter and growing system to fit the style of your home or garden. Warm wood veneers can match your favorite furnishings. Colorful stain finishes can freshen up your look. Farm Tub Planters have made growing your own food never look so good. 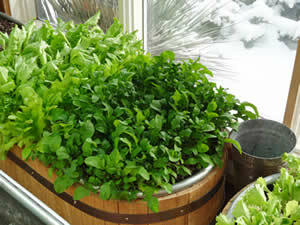 You’re the designer so let Farm Tub help you bring more green into your life and healthy food to your table.